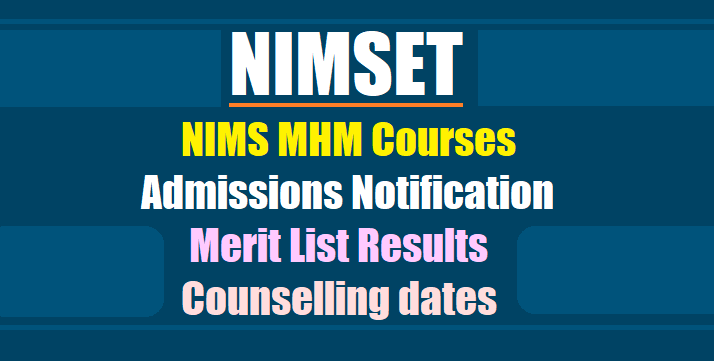 Nizam's Institute of Medical Sciences, Punjagutta, Hyderabad, Telangana State has given the NIMS NIMSET MHM Course 2018 admission Notification and Applications are invited from eligible candidates of Telangana and Andhra Pradesh States for admission into Master in Hospital Management course for the year 2018. NIMS MHM Courses Admissions 2018 notification, NIMS MHM Course application form 2018. Any graduate in Medical/ Non Medical courses.Age: The minimum age for admission shall be 20 years completed and should not be more than 30 years as on 31st December 2018. Selection will be made based on the performance of the candidates at the entrance test. 1. Selection will be made based on the performance of the candidates at the entrance examination and Viva. board of the Institute/website as per the prescribed dates mentioned in prospectus. 4. The selection shall be based on the merit taking into consideration of the marks obtained in entrance examination + viva. The statutory reservation rules and GOP No.646, dt.10‐07‐1979 for local area reservations will be followed for selection of candidates into admissions. They shall have to come for admission on the date notified. Candidates have to report for admission in person with hall‐ticket, bond (Annexure‐II) and other required documents (Annexure IV) as per admission prospectus. Non‐attendance to the admission shall render the candidate forfeiting his/her admission. No request for postponing the date of admission or request to appear at an earlier date shall be entertained. In the event a candidate fails to report for the admission at the date and time specified, the seat shall be offered to the next merit candidate as per the admission prospectus. 1. Entrance Test shall be conducted at the venue, date and time specified by the Institute in hall ticket. 2. Hall Tickets for the entrance examination shall be available for printing to eligible candidates whose applications are complete and accurate in all respects on or after 05‐08‐2018. iii. The number of students called for VIVA shall be in the ratio of 1:2 for assessing their aptitude, communication and presentation skills. 4. The candidates shall qualify in entrance examination, by securing 30% of 70 marks in case of OCs and BCs. There shall be no minimum qualifying marks for the candidates belonging to the category of Scheduled Castes and Scheduled Tribes. 6. The qualified candidates shall get prepared to attend for the Viva on the date and time specified in the prospectus with structured bio‐data showing experience, awards & medals if any, along with original certificates. No request for postponing the date of Viva or request to appear at an earlier date shall be entertained. 7. Candidate appearing for the entrance test/viva will not be paid any travelling allowance. 8. Candidates indulging in malpractice during the entrance examination will be disqualified and their hall‐tickets shall be confiscated. The marks of such candidates will not be displayed. The candidates are requested to visit website: www.nims.edu.in for application form, prospectus and also for any updates. The filled in application forms shall be submitted along with Demand Draft in favour of Director, NIMS or NIMS cash receipt and supporting documents as detailed in prospectus (Annexure I) in person or by post (preferably by India Post services) so as to reach the Associate Dean, Academic-2, 2"d floor, Old OPD Block, NIMS, Punjagutta, Hyderabad-500 082, Telangana before 5.00 PM of 29-07-2018.